THAT MICK MCCARTHY is preparing for his first game in charge of Ireland against the backdrop of an FAI controversy involving a J. Delaney is not the only bit of symmetry with the past this week. The last time a League of Ireland player was capped in a competitive, senior international for Ireland was back in 1985, the player a ‘Byrne’, playing for Shamrock Rovers. On that occasion it was Pat Byrne, who came on as a substitute in a 4-1 hammering at home to Denmark, in what was Eoin Hand’s final game in charge. 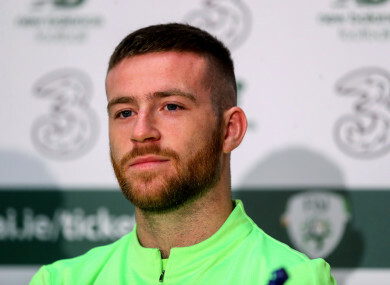 That Jack has swapped training at Tallaght for Abbottstown this week means that he may emulate his namesake by appearing against either Gibraltar or Georgia in qualifiers for Euro 2020. He wasn’t included in McCarthy’s provisional squad, but impressed the onlooking manager in Rovers’ 3-0 win against Sligo at Tallaght last Friday, to the point that McCarthy said he was a contender for future squads in his weekly interview with the FAI website on Sunday afternoon. Within a couple of hours, Callum O’Dowda was ruled out with a knee injury and Byrne was given a call. “It’s been a mad couple of days, and I’m still trying to get my head around it”, the Rovers attacker told a press conference. “I’m delighted for Shamrock Rovers giving me the chance as well. Byrne is still only 22, and is back at Rovers following a series of disappointments after leaving Manchester City. While at the club, Patrick Vieira compared him to Roy Keane and he impressed during a loan spell with Cambuur in Holland. Although he still had a lot of time left on his contract at City, Byrne wanted to play first-team football, so left for Wigan. The manager who signed him, Warren Joyce, was sacked within weeks, and Byrne drifted for a while with further underwhelming spells at Blackburn, Oldham, and Kilmarnock. “Yeah, I left Man City and signed a deal with Wigan and two or three weeks later the manager was gone that signed me, but you can’t dwell on these things. It was a big decision for me to leave Man City at the time, I could have easily stayed there and went back to the U23s or went back out on loan but I wanted to try and prove that I was ready for men’s football, and the gamble didn’t pay off at the time unfortunately. The blooding of domestic players in the cut and thrust of serious international games rarely happens, either. Byrne agrees that his call-up is good news for the other players in the league of Ireland. “It’s good for the younger players in the league, I’m still only 22 as well but I think it’s good for the likes of Trevor Clarke and Brandon [Kavanagh] at our club as well after getting called up to the U21s. Byrne shook hands with every journalist in the room ahead of sitting down to speak, eager to make an impression. An appearance for Ireland on Saturday would make an historic one. Email “'It’s been a mad couple of days, and I’m still trying to get my head around it'”. Feedback on “'It’s been a mad couple of days, and I’m still trying to get my head around it'”.